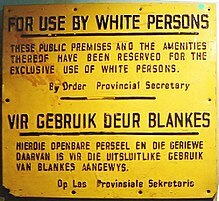 Is éard a bhí i gceist leis an apairtéid (nó apartheid) ná an córas cinedheighilte a bhí i bhfeidhm san Afraic Theas ón mbliain 1948 go dtí na 1990idí. Tháinig an focal féin apartheid ón Afracáinis, an leagan den Ollainnis a labhraítear san Afraic Theas, agus is é is brí leis ná "scarúint" nó "scarthacht" (apart = scartha, -heid = -cht, cf. an iarmhír -heit sa Ghearmáinis agus -hood i bhfocail Bhéarla cosúil le neighbourhood, manhood nó maidenhood). Tháinig an córas seo in úsáid nuair a ghnóthaigh na páirtithe Búracha, an Páirtí Náisiúnaíoch agus an Páirtí Afrikaner, olltoghcháin na bliana 1948. Fógra ar an trá - Durban - 1989. Cathair Durban: De réir Alt a 37 i bhfodhlíthe na trá, níl cead isteach ach ag daoine den chine gheal sa láthair shnámha seo, a deir sé i mBéarla, in Afracáinis agus i Súlúis. I ré na cinedheighilte, bhí muintir na hAfraice Theas deighilte ina gceithre chine, mar atá, na Bána, na Gormaigh, na Daiteánaigh agus na hIndiaigh, agus na dreamanna seo á gcoinneáil scartha scoite ó chéile. Luíonn sé le réasún nach raibh cead ag aon duine pósadh thar theorainn na gciníocha, ach, thairis sin, ní raibh de chead acu dul ag snámh sna cladaí céanna, úsáid a bhaint as na leithris chéanna, ná dul ar na scoileanna céanna. Rinneadh iarrachtaí leis na ciníocha éagsúla a chosaint ar chuideachta a chéile ar gach leibhéal. Chualathas an focal "apartheid" an chéad uair ó bhéal Jan Smuts, thiar sa bhliain 1917, nó dhá bhliain sular bhain sé amach Príomh-Aireacht na hAfraice Theas. Deir daoine áirithe inniu nach raibh i gceist san am ach leanúint leis na dlíthe cinedheighilte a bhí i bhfeidhm san Afraic Theas roimhe sin. Bhí na dlíthe seo bunaithe ar choinníollacha na síochána a shocraigh na Sasanaigh leis na Bóraigh i ndiaidh Chogadh na mBórach. Go bunúsach, áfach, b'í an scarúint pholaitiúil éirim an scéil, seachas an chinedheighilt. Le linn an Dara Cogadh Domhanda, thosaigh an Páirtí Aontaithe ag éirí as an gcuid is déine den chinedheighilt. I dtoghcháin na bliana 1948, bhí feachtas an Pháirtí Náisiúnta - páirtí náisiúnaíoch na mBórach - bunaithe ar cheist an pholasaí apairtéide, agus vótáladh isteach iad maille leis an bPáirtí Afrikaner. Ba é Daniel François Malan a bhain amach oifig an Phríomh-Aire. Ar an toirt, thosaigh rialtas na Náisiúnaithe ag cur córas na hapairtéide i bhfeidhm. Cuireadh cosc le caidreamh craicinn, cleamhnas agus pósadh idir daoine a bhain le dreamanna éagsúla cine, tugadh isteach aicmiú na ndaoine de réir a gcine, agus bunaíodh bord aicmiúcháin le ceist aon duine a fhuascailt nach mbeadh inaicmithe ar an chéad dul síos. Sa bhliain 1950, tháinig an tAcht um Cheantair na nDreamanna (Group Areas Act) ar leabhar na ndlíthe, agus ba ar an dlí seo a bunaíodh iarrachtaí na n-údarás leis na ciníocha difriúla a choinneáil ina gcónaí scartha ó chéile. Reachtaíodh an tAcht um Áiseanna Scartha (Separate Amenities Act) le cladaí snámha, busanna, otharlanna, agus ollscoileanna scartha a bhunú do na ciníocha éagsúla. Na pas-dlíthe a bhí ann cheana féin, tugadh chun déine iad. Cuireadh d'fhiachaibh ar na Gormaigh agus ar na Daiteánaigh cáipéisí aitheantais ar leith a iompar. Na cáipéisí seo, nó an domboek mar a thugtaí orthu as Afracáinis, cineál pas a bhí iontu a chuir ar chumas duine de mhuintir na gceantar gorm bheith ag obair sa chuid gheal den tír. Ní raibh oiread is cead isteach ag na Gormaigh sna ceantair gheala gan cháipéisí oifigiúla ar leith. I ndiaidh Malan, tháinig Johannes Gerhardus Strijdom i gceannas ar an tír mar Phríomh-Aire, sa bhliain 1954. Chrom Strijdom ar an mbeagán cearta a bhaint de na Daiteánaigh agus na Gormaigh a bhí fágtha acu go fóill. An rialtas a bhí ann roimhe sin, chuir sé an Bille um Ionadaíocht Scartha na Vótálaithe (Separate Representation of Voters Bill) faoi bhráid na pairliminte sa bhliain 1951. Thug ceathrar vótálaithe a raibh tacaíocht an Pháirtí Aontaithe an bille chun na cúirte, áfach, ó nach raibh siad den tuairim go raibh sé ag teacht leis an mbunreacht. Chumhdaigh Cúirt Uachtarach na Rinne (Cape Supreme Court) an dlí, ach d'easaontaigh an Chúirt Achomhairc leis an gcinneadh seo, nó fuair sí an t-acht neamhbhailí, nó bhí sé ag teacht salach ar an mBunreacht, agus chaithfí dlí den chineál sin a reachtú mar athrú bunreachta, is é sin, bhí tromlach dhá dtrian de dhíth i dhá theach na Parlaiminte le bailíocht a chinntiú don acht. Ansin, rith an Rialtas an Bille um Ardchúirt na Pairliminte (High Court of Parliament Bill) a thug an ceart don Phairlimint comhairlí na gcúirteanna a chur ar neamhní. Níor ghlac Cúirt Uachtarach na Rinne ná an Chúirt Achomhairc leis an mbille seo, áfach. Sa bhliain 1955, chuir rialtas Strijdom breithiúna breise ar an gCúirt Achomhairc. Náisiúnaithe Bóracha ab ea iad na breithiúna nua, ar ndóigh. Thairis sin, méadaíodh an Seanad ó naoi suíochán is dhá scór go naoi suíochán is ceithre scór. Fuair Seanadóirí Náisiúnaíocha seacht gceann déag is trí scór de na suíocháin seo. Sa deireadh thiar thall, ritheadh an Bille um Ionadaíocht Scartha sa bhliain 1956, agus baineadh na Daiteánaigh de rolla na vótálaithe geala. Cuireadh ar rolla dá gcuid féin iad. An leagan leasaithe den Acht um Mígheanmnaíocht (1950), a rinne coir thromchúiseach d'aon chaidreamh chollaí idir duine geal agus duine d'aon chine eile. An tAcht um Chlárú an Daonra (1950), a chuir d'fhiacha ar gach saoránach é féin a chlárú mar bhall de cheann de na príomhdhreamanna cine, mar atá, Geal, Gormach, nó Daiteánach. An tAcht um Thoirmeasc an Chumannachais (1950). Bhaintí úsáid as an reacht seo leis an bhfreasúra a chur ina thost, nó bhí sé indéanta páirtí ar bith a chosc ach "páirtí Cumannach" a ghairm de. Bhí an Cumannachas sainmhínithe chomh neamhchruinn is go bhféadfá "Cumannach" a bhaisteadh ar aon duine a bhí ag éileamh chothrom na Féinne do na dreamanna cine ar fad - is é sin, Cumannach de réir an dlí. An tAcht um Cheantair na nDreamanna (an 27ú lá de Mhí Aibreáin 1950). B'é seo príomhdhlí na hapairtéide, nó dheighil sé an tír ina ceantair éagsúla le haghaidh dreamanna éagsúla cine. An tAcht um Údaráis Bhantúcha (1951). Bhunaigh an dlí seo forais scartha rialtais do na Gormaigh. An tAcht um Chosc na Lonnaitheoireachta Neamhdhlíthiúla (1951). Chuir an dlí seo ar chumas an Stáit slumanna de chuid na nGormach a scartáil. Ó bhí na jabanna gann sna ceantair ghorma, bhí sé de chlaonadh sna Gormaigh lonnú in aice na hoibre, taobh istigh de na ceantair a bhí ceaptha do na Geala. Mar sin, theastaigh cumhachtaí ó na húdaráis leis na slumanna a chur de dhroim an tsaoil a bhíodh ag fás go spontáineach ar an dóigh seo. An tAcht um Oibrithe Bundúchasacha Tógála agus um Tobhach le haghaidh Seirbhísí do na Bundúchasaigh (1951). De réir an dlí seo, chaithfeadh na fostóirí geala tobhach a íoc le tithíocht a sholáthar do na hoibrithe gorma a raibh cead dlíthiúil acu lonnú sna ceantair gheala. An tAcht um Áiseanna Scartha (1953). Choisc an dlí seo ar na dreamanna difriúla cine úsáid a bhaint as áiseanna a bhí ceaptha do cheann de na dreamanna eile. Is é an cineál áiseanna a bhí i gceist ná sconnaí fíoruisce, leithris agus araile. An tAcht um Oideachas do na Bantúigh (1953). Chuir an dlí seo deireadh le scoileanna na misinéirí do na Gormaigh. Anois, chaithfidís dul ar scoileanna an stáit. An tAcht um Cheantair Uirbeacha Bhantúcha (1954). Chuir an dlí seo srianta le lonnú na nGormach sna cathracha. An tAcht um Poill Mhianaigh agus um Chúrsaí Oibre (1956). Bhí an chinedheighilt san obair bunaithe ar an dlí seo. An tAcht um Chur chun Cinn an Fhéinrialtais do na Gormaigh (1958). Leis an dlí seo, bunaíodh rialtais dúchais do na dreamanna éagsúla de Ghormaigh sna "tíortha dúchais" (homelands as Béarla, thuislande as Afracáinis). Stáit soip a bhí iontu a cuireadh ar bun faoin tuath, i bhfad ó na cathracha móra a raibh na Gormaigh ag tarraingt orthu ar lorg jabanna. D'fhéadfadh na Gormaigh vóta a chaitheamh sna tíortha seo, agus bhí na tíortha seo le sórt "neamhspleáchais" a fháil sa deireadh. Go praiticiúil, bhí an-tionchar ag rialtas na hAfraice Theas ar na tíortha seo fiú i ndiaidh dóibh "neamhspleáchas" a bhaint amach. Is ar éigean a d'fhéadfá vóta a chaitheamh ar son aon pháirtí nó duine nach mbeadh sásta urraim a thabhairt do shainleasanna na máthairthíre. An tAcht um Chorparáid Infheistíochta do na Bantúigh (1959). Leis an dlí seo, cruthaíodh áiseanna le rachmas a infheistiú sna "tíortha dúchais" chun jabanna a sholáthar do na daoine ansin. Ar an 6 Meán Fómhair 1966, sádh le scian cúpla uair sa chroí Príomh-Aire na hAfraice Theas, Hendrik Verwoerd. Eisean a chruthaigh polasaithe ciníocha apairtéid. Ar an 18 Márta 1995, vótáil na daoine geala deireadh a chur leis an apairtéid. ↑ BBC "South Africa votes for change"
Tugadh an leathanach seo cothrom le dáta an 11 Feabhra 2018 ag 19:25.